Wi-Fi for your Droid Bionic is the same wireless networking standard used by computers for communicating with each other and the Internet. To make Wi-Fi work on your Droid Bionic requires two steps. First, you must activate Wi-Fi, by turning on the phone’s wireless radio. Second, you must connect to a specific wireless network. Choose Wi-Fi to place a green check mark by that option. A green check mark indicates that the phone’s Wi-Fi radio is now activated. The next step is to connect the Droid Bionic to a Wi-Fi network. 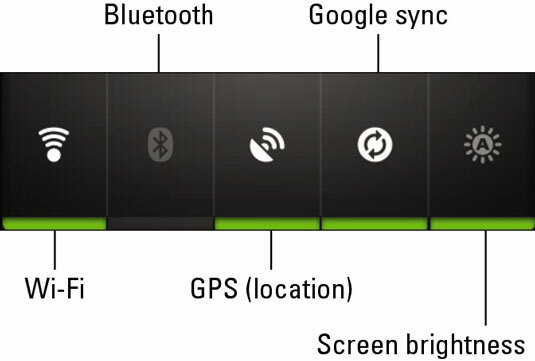 A quicker way to activate the Droid Bionic’s Wi-Fi radio is to use the Power Control widget, shown in this figure. The widget isn’t preinstalled on the phone; you need to add it to one of the Home screen panels. Touch the Power Control widget’s Wi-Fi button and the Droid Bionic turns on its Wi-Fi abilities. To turn off Wi-Fi, repeat the Steps 1 – 3 and deselect Wi-Fi in Step 3. Doing so turns off the phone’s Wi-Fi access, disconnecting you from any networks. Using Wi-Fi to connect to the Internet doesn’t incur data usage charges. The Wi-Fi radio places an extra drain on the battery, but it’s truly negligible. If you want to save a modicum of juice, especially if you’re out and about and don’t plan to be near a Wi-Fi access point for any length of time, turn off the Wi-Fi radio.